Every session includes a complimentary consult in your home two weeks before the shoot. Jaimy will look at the outfits you already have picked out and make suggestions to enhance each one. She can even go through your closet with you to find the perfect ensemble to match your unique style. Don't forget that adding a jacket or the perfect pair of earrings can make your look polished and complete. Did you know that the camera diminishes your features 30% and can intensify imperfections? Choose the Vogue session to get photo ready makeup enhancement included with your senior experience. Apply your own foundation and Jaimy does the rest while working with you to achieve the effect you desire. Start with an "every-day" look and switch it up during the session for a high fashion, glamorous style. You are truly unique and so will be your senior photo shoot. At your home consult Jaimy will make (and take) location suggestions based on your personal style. Family farm? No problem. Urban/Grunge? Why not? Do you participate in an activity that you want to capture with your senior portraits? You can go anywhere from a dance studio to a football field to a performance theater, it's up to you! Click HERE to see some of my favorite sessions! Need help with outfits? get a What to wear guide in every welcome packet! but shhhh...the details are a surprise! Over 10 years experience in the photography industry. Nationally award winning albums and images. PPA Master and Certified Professional Photographer. Learn more about Jaimy HERE. Find out available dates and pick your session. Secure your spot by paying the session fee online. Watch the snail mail for your welcome pack containing styling tips, skin care regimen and fun surprises. Get your name on the VIP mailing list and automatically receive a link to the Senior Magazine 2019 containing all the deets on a custom portrait experience including a full price guide and product menu. 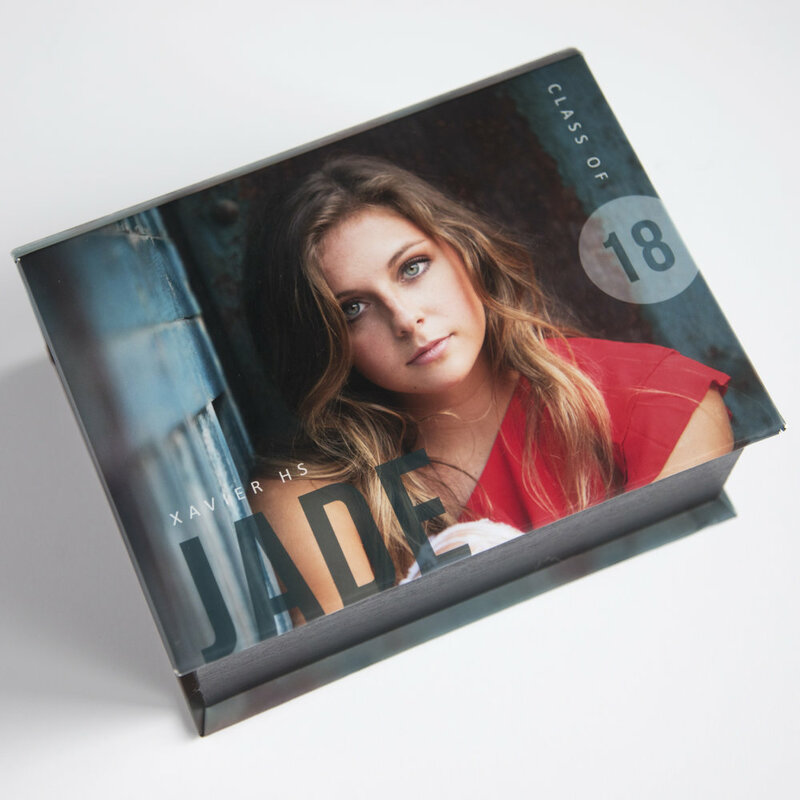 Finish your senior portrait experience by getting one-of-a-kind products to preserve this crazy fun time of your life. Anything from prints and wall art, to ePhotos, to custom designed albums and box sets. Every product is created with you in mind and will last the test of time. All prints are mounted and finished with archival spray. Order a la cart or choose a Collection to receive special discounts and goodies. Start your senior portrait experience TODAY! Spots are limited and sell out fast. Send an email for a list of available dates. now accepting applications through Feb 28th for classes of 2020, 2021, and 2022! NEW and now accepting applications to become an influencer for my brand! Starting this year teens from the eastern Iowa corridor are invited to become a JE Influencer and take part in an amazing networking and photography experience. So...what does this mean exactly? Join a team of high school teens from around the eastern Iowa corridor. Make connections that can last a lifetime and be a part of something unforgettable! Take part in exclusive, super creative photo shoots like neon lights at night or carnival rides! Get a personalized phone app to share images from each shoot you participate in. Share your pics all over social media! Discounted Senior Session Fees. Free personal phone app. Exclusive stylized photo shoots. Images for social media sharing. The chance to win the referral program Swag Bag filled with gift cards to all your favorite places to shop. Interested in Applying? Follow @jaimyellis.photog on instagram and watch for announcements on when applications are being accepted.